Gerard ter Borch (1617–1681), Mother Combing the Hair of Her Child (Hunting for Lice) (c 1652-53), oil on panel, 33.5 x 29 cm, Koninklijk Kabinet van Schilderijen Mauritshuis, The Hague, The Netherlands. Wikimedia Commons. The Dutch Golden Age must have been an exciting time to live, when every decent-sized town seems to have had its own Master painter, and even the middle classes were keen to buy their work. This month marks the four hundredth anniversary of the birth of one of the most important Golden Age artists who you (probably) won’t have heard of: Gerard ter Borch (1617–1681), also known as Gerrit ter Borch, Terborch, or even Terburg. His work was important to that of Vermeer, and to figurative painting as a whole. Ter Borch was born in the central Netherlands city of Zwolle, his father being a master draftsman and artist who had the same name, so technically his father was ‘the Elder’, and he ‘the Younger’. He was precocious in both drawing and painting, and was soon making excellent drawings. His father appears to have been his main teacher, particularly during his early training, although he is thought to have spent time as an apprentice with others too. 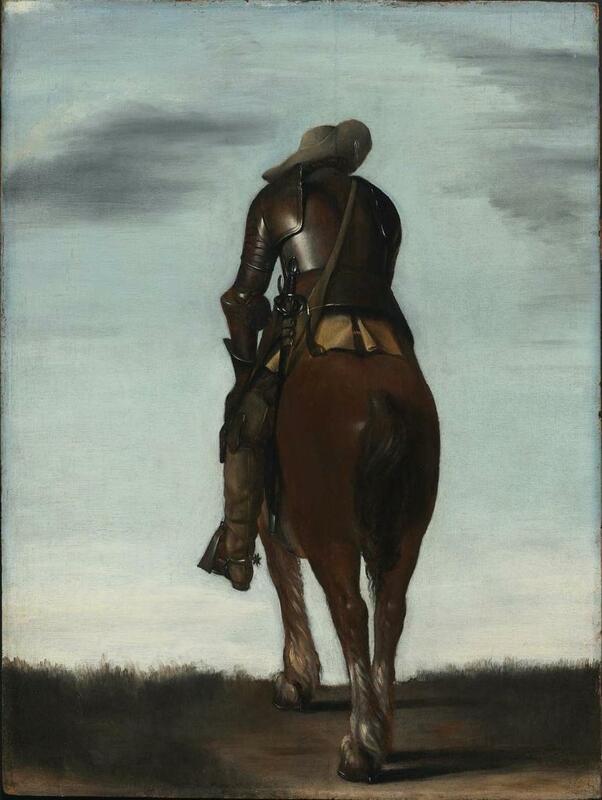 Gerard ter Borch (1617–1681), Man on Horseback (1634), oil on panel, 54.9 x 41 cm, Museum of Fine Arts, Boston, MA. Wikimedia Commons. Ter Borch painted this Man on Horseback in 1634, when he was only seventeen, basing it on a drawing which he had made when he was only eight. Soon after this, ter Borch is thought to have visited London, then to have made his way to Rome by 1641. In those locations, and others in Europe, he concentrated on painting portraits, but a period spent in Münster, Germany, coincided with peace negotiations there, and led to one of his masterpieces. Gerard ter Borch (1617–1681), The Ratification of the Treaty of Münster, 15 May 1648 (1648), oil on copper, 45.4 x 58.5 cm, Rijksmuseum Amsterdam, Amsterdam, The Netherlands. Wikimedia Commons. For the thirty years between 1618-1648, central Europe had been engulfed in a bitter war between the Habsburg states, including the Holy Roman Empire and Spain, and their enemies, including the Dutch Republic. 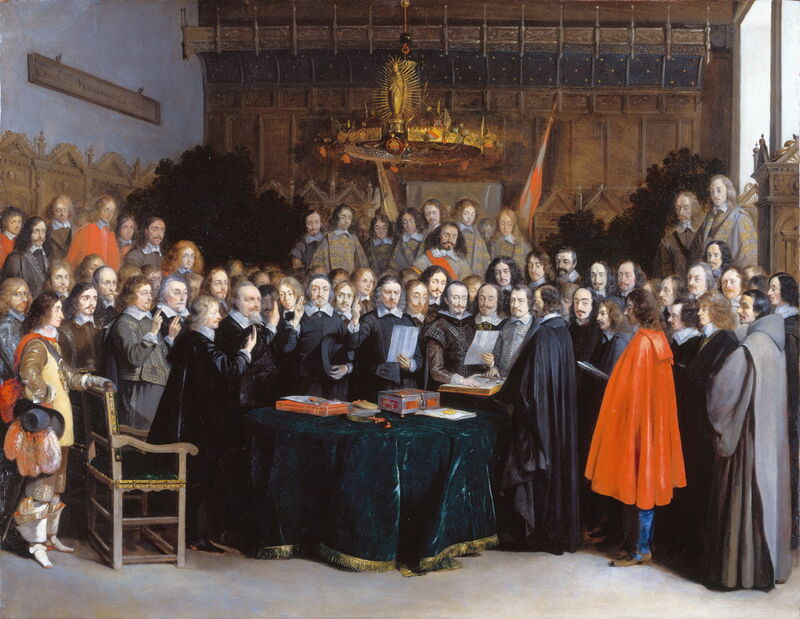 Ter Borch’s magnificent painting of The Ratification of the Treaty of Münster, 15 May 1648 (1648) recorded the moment that the Thirty Years War ended, with the ratification of this treaty between the Dutch Republic and Spain. It also marked the birth of the Dutch Republic as an independent country. The artist even seized the opportunity to include himself among the ranks of dignitaries: he is at the far left, with long hair and looking directly at the viewer. Although this may look a large and grand work, ter Borch painted it on copper, and it is little larger than a miniature. Ter Borch’s portraits were also generally small, and often full-length, a relatively novel format for the time; they were significant in popularising the format and developing portraiture as a distinct genre. In the late 1640s, he spent a little time in Madrid, but seems to have left there in something of a hurry, perhaps as the result of an intrigue, and returned to the Netherlands. Gerard ter Borch (1617–1681), Portrait of Helena van der Schalcke (1646-1671) (c 1648), oil on panel, 34 x 28.5 cm, Rijksmuseum Amsterdam, Amsterdam, The Netherlands. Wikimedia Commons. This charming Portrait of Helena van der Schalcke (1646-1671) was painted in about 1648, when she must have been little more than two years old. Nevertheless she is dressed as if fully-grown, with a small wicker bag on her arm. During the 1650s, ter Borch evolved these full-length portraits into domestic genre scenes, which were influential on Vermeer’s work, and of lasting impact. Gerard ter Borch (1617–1681), Seated Girl in Peasant Costume (c 1650), oil on panel, 28 x 23 cm, Rijksmuseum Amsterdam, Amsterdam, The Netherlands. Wikimedia Commons. 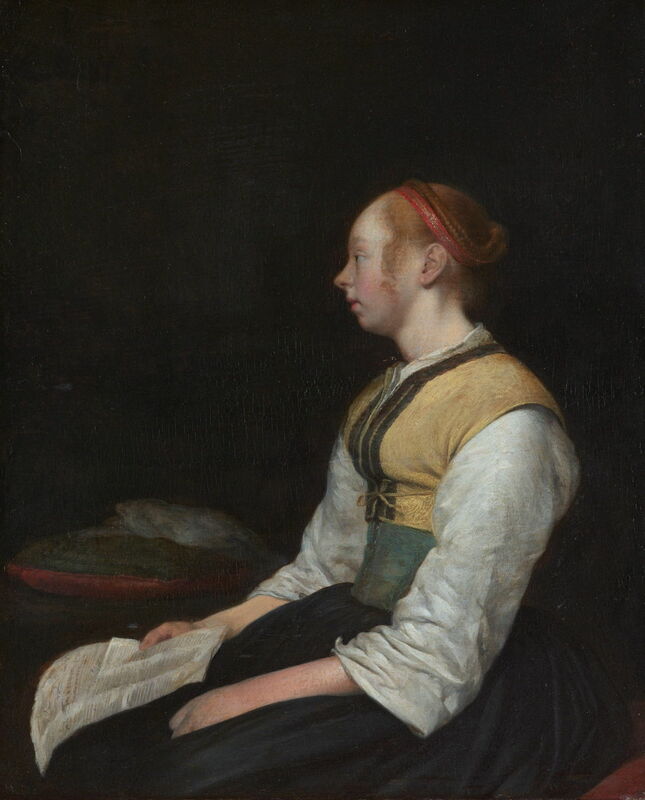 Ter Borch’s Seated Girl in Peasant Costume from about 1650 sets the style. Using his younger half-sister Gesina as his model, she sits in the near-blackness of a domestic interior, a pet stretched out on a cushion behind her. She has been reading the sheets held in her right hand, looked up from them, and now gazes in thought into the distance to the left. Ter Borch leaves the viewer to speculate as to the underlying story. Is this a letter that she has been reading? Was the news good or bad, or is she now trying to get her head around a difficult situation? Gerard ter Borch (1617–1681), The Messenger (Unwelcome News) (1653), oil on panel, 66.7 x 59.5 cm, Koninklijk Kabinet van Schilderijen Mauritshuis, The Hague, The Netherlands. Wikimedia Commons. The Messenger, popularly know as Unwelcome News, from 1653, develops this more explicitly. The young man at the left is still booted and spurred from riding to deliver a message to this couple. Slung over his shoulder is a trumpet, to announce his arrival and importance. The recipient wears a shiny breastplate and riding boots, and is taken aback at the news which the messenger brings. His wife leans on her husband’s thigh, her face looking serious. The scene is the front room of a house in the Golden Age. Behind them is a traditional bed (typical in living areas at the time), with some of their possessions resting on a table between the couple and their bed. Hanging up on a bedpost is the husband’s sword, and behind them is a gun and powder horn. Is the letter news of his recall to military service, perhaps? Will he soon have to ride away from his wife, leaving her to bring up their family? Gerard ter Borch (1617–1681), A Maid Milking a Cow in a Barn (c 1652-54), oil on panel, dimensions not known, The Getty Center, Los Angeles, CA. Wikimedia Commons. 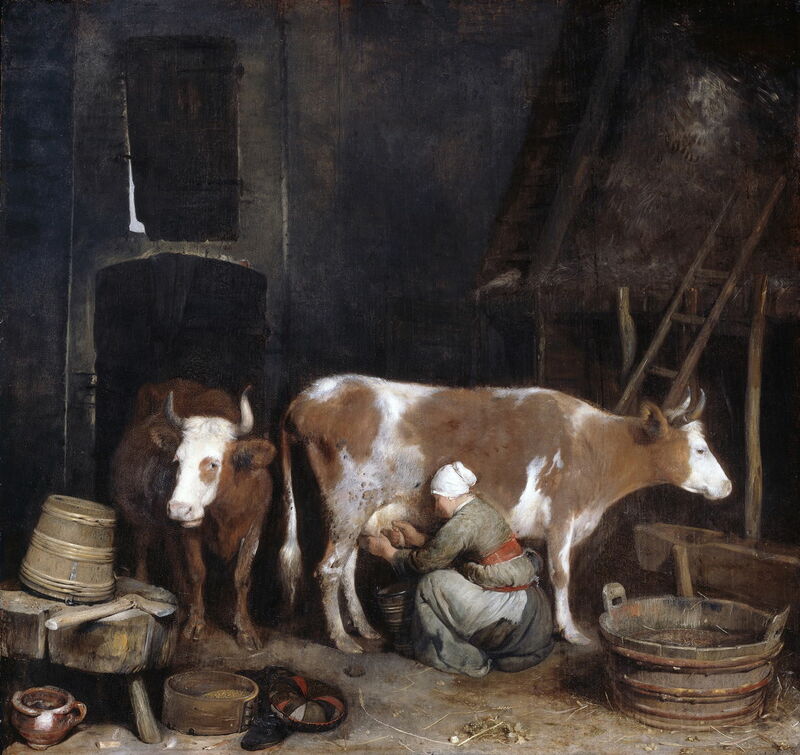 At about the same time, ter Borch painted A Maid Milking a Cow in a Barn (c 1652-54), which incorporates its own still life of everyday farming objects such as a winnowing sieve and an axe. 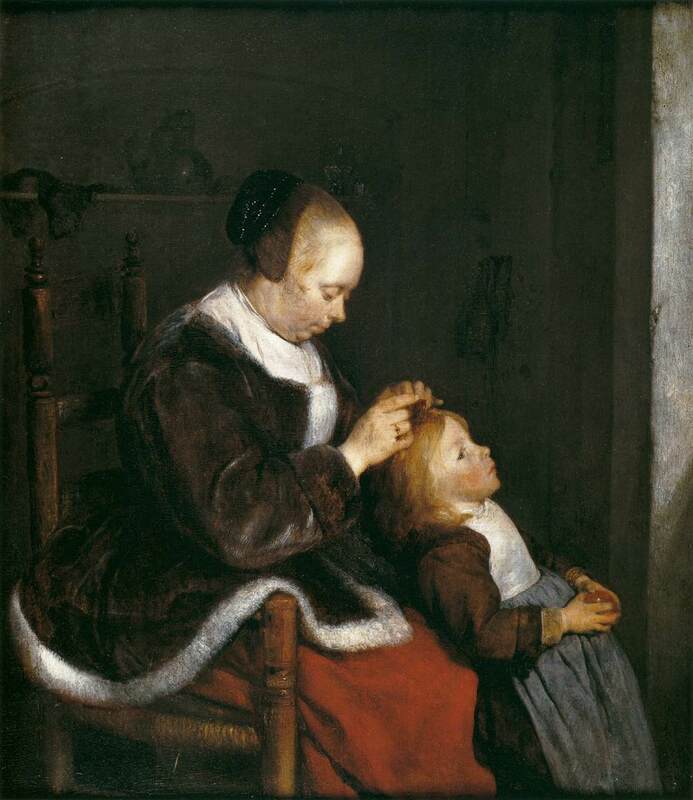 Ter Borch’s Mother Combing the Hair of Her Child shows a regular domestic routine, expressed more bluntly in its alternative title of Hunting for Lice (c 1652-53). The mother is looking intently at her young daughter’s hair for traces of lice and nits, and running a fine-tooth comb through it to remove any. Gerard ter Borch (1617–1681), The Van Moerkerken Family (c 1653-54), oil on wood, 41.3 x 35.6 cm, The Metropolitan Museum of Art, New York, NY. Wikimedia Commons. 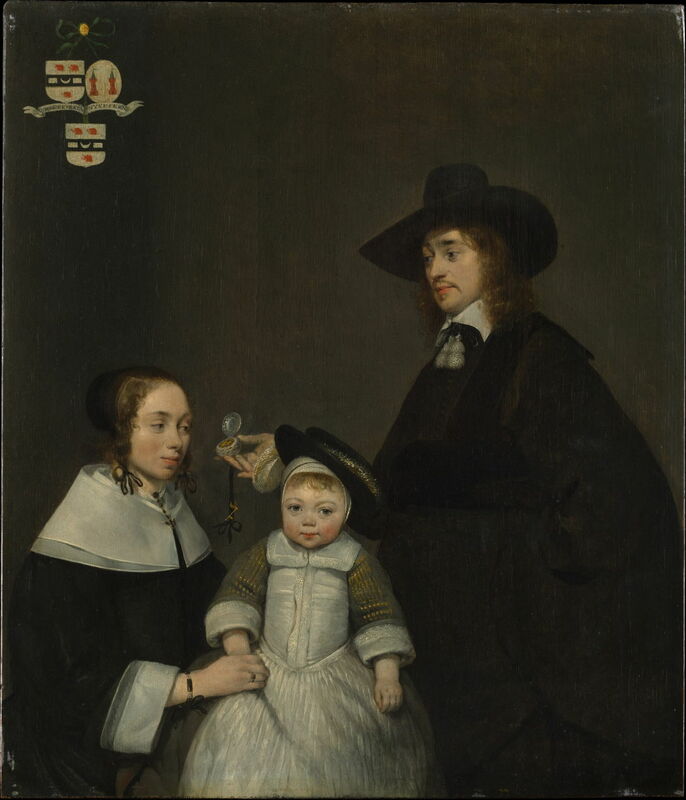 His portrait of The Van Moerkerken Family (c 1653-54) shows another interesting scene. The father holds two clues to his identity and importance: a decorated cap, and a small egg-like accessory, which might have been a watch or a keepsake, perhaps. His wife looks at that, rather than their small girl, who stands in front and fixes the viewer in her gaze. At about this time, in the early 1650s, ter Borch met the young Johannes Vermeer (1632-75), although it is not known how much of ter Borch’s work Vermeer may have seen, nor whether they maintained contact or friendship. 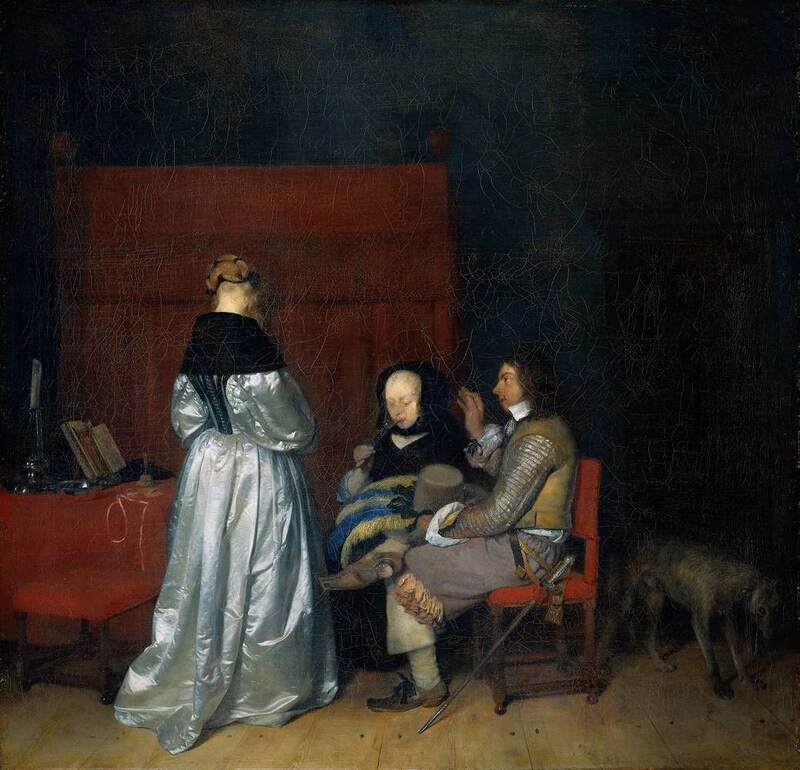 Gerard ter Borch (1617–1681), Three Figures Conversing in an Interior (Paternal Admonition) (c 1653-55), oil on canvas, 71 x 73 cm, Rijksmuseum Amsterdam, Amsterdam, The Netherlands. Wikimedia Commons. 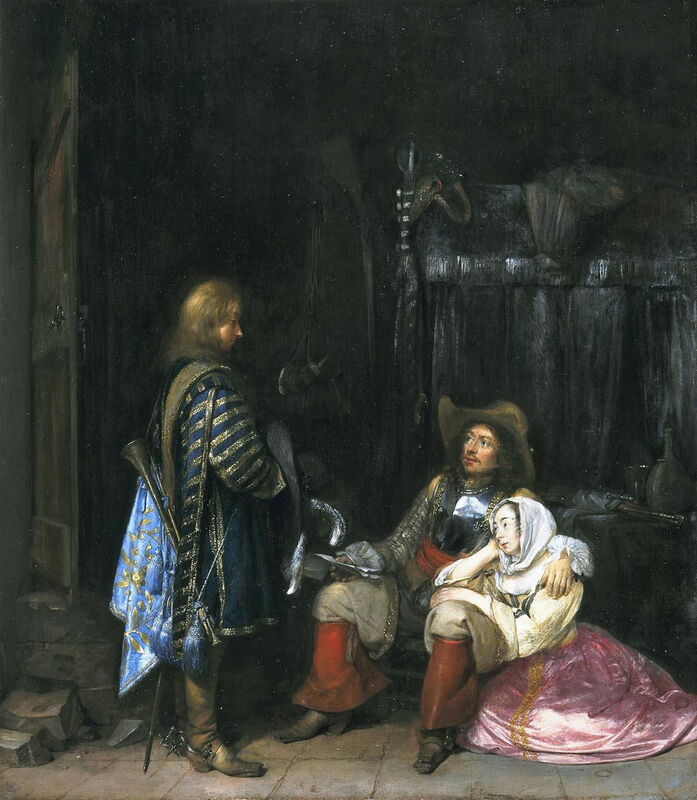 Three Figures Conversing in an Interior is another of ter Borch’s narrative genre works, more popularly known as Paternal Admonition (c 1653-55). Standing with her back to us, wearing a plush going-out dress, is the daughter. To her left is a table, on which there is a small reading stand with books, almost certainly including a Bible. Her parents are young, and they too are fashionably dressed. Her mother appears to be drinking from a glass, but her father is at the very least cautioning his daughter, if not giving her a thorough dressing-down. He wears a sword at his side. Behind them is a large bed, and to the right the family dog looks on from the gloom. 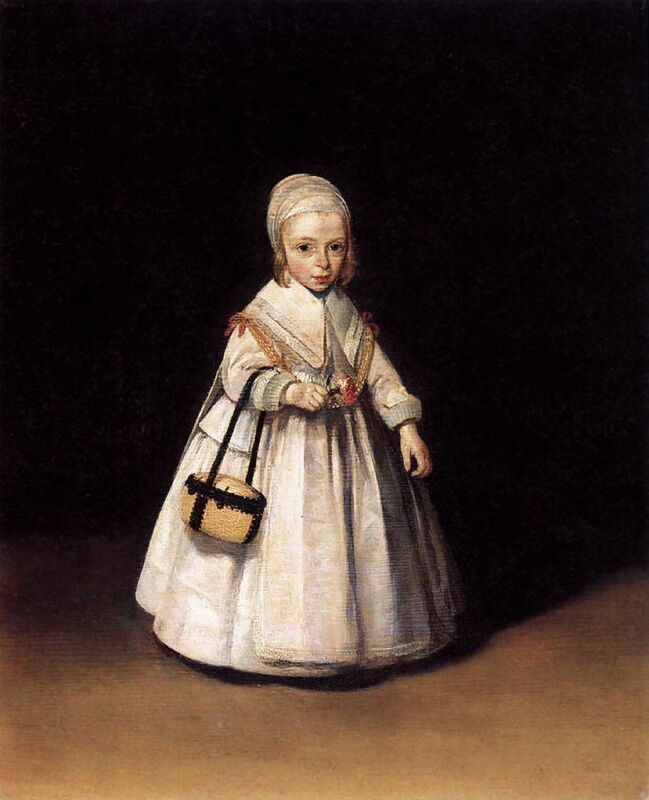 Ter Borch’s rendering of the daughter’s dress is remarkable, and illustrates one of his great strengths. Other fine detail in the clothing is shown with great care and realism. By 1650, ter Borch settled in Deventer in the Netherlands, where he married in 1654, and was to remain until his death. Posted in General, Life, Painting and tagged genre, Golden Age, painting, ter Borch, Vermeer. Bookmark the permalink.